With unprecedented access to the inner workings of the most famous counter culture festival in the world, this film explores the philosophy that fuels it, the culture that drives it & the transcendent experience that makes it a worldwide phenomenon. Brisk, funny, and insightful... the filmmaking is exhilarating! Burning Man is an amazing event, and for those unable to make the trek or withstand the elements, this DVD provides an insightful, although brief, glimpse that will make you hunger for a more active role in the experience. 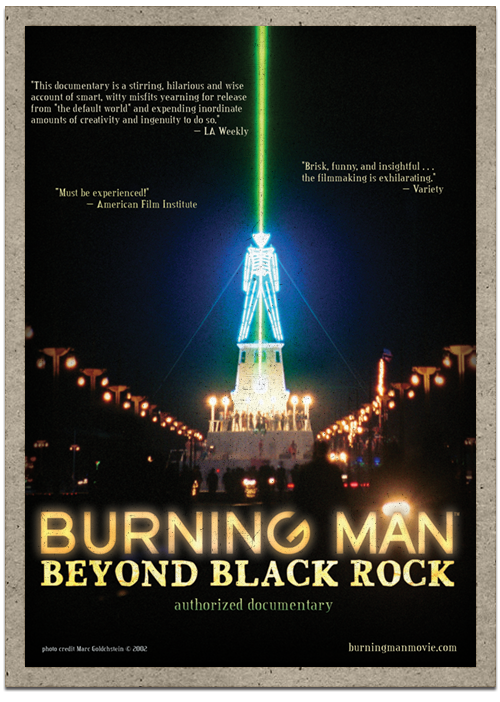 Burning Man: Beyond Black Rock is now available across American Cable in Movies on Demand! Explore the driving philosophy behind a social revolution that has ignited a global cultural force as filmmaker Damon Brown takes cameras behind the scenes of the Burning Man Festival to learn about the complexity and diversity of this landmark event. By spending 18 months with the organizers, founders, participants, and artists whose contributions have all propelled the Burning Man Festival to become one of the defining events of a generation, filmmakers look beyond the surface to reveal just what impact this remarkable subculture can have on a global scale.